The Concordia Stingers raced out to a three-goal lead on the Ottawa Gee-Gees, but they ultimately lost 5-4 in a shootout on Sunday afternoon at home in the Ed Meagher Arena. “It’s one of those [games] where you kind of shake your head a little bit afterwards because we put in a really great effort, but maybe we needed to play 10 more solid minutes,” said Julie Chu, interim head coach of Concordia’s women’s hockey team. Ottawa mounted pressure on the Stingers in the opening minutes of the first period, but didn’t score when given the chance. Instead, Concordia scored two goals in the first, thanks to forwards Devon Thompson and Tracy-Ann Lavigne. The tides would continue to turn in favour of Concordia, as their fast-paced styled troubled Ottawa, who struggled to adapt. Forward Ann-Julie Deschenes added a third goal for the Concordia Stingers within the opening minutes of the second period, giving her team a 3-0 lead. But the game would change from there as Gee-Gees’ forward Roxanne Rioux added two in the third period to bring the score to 3-2. 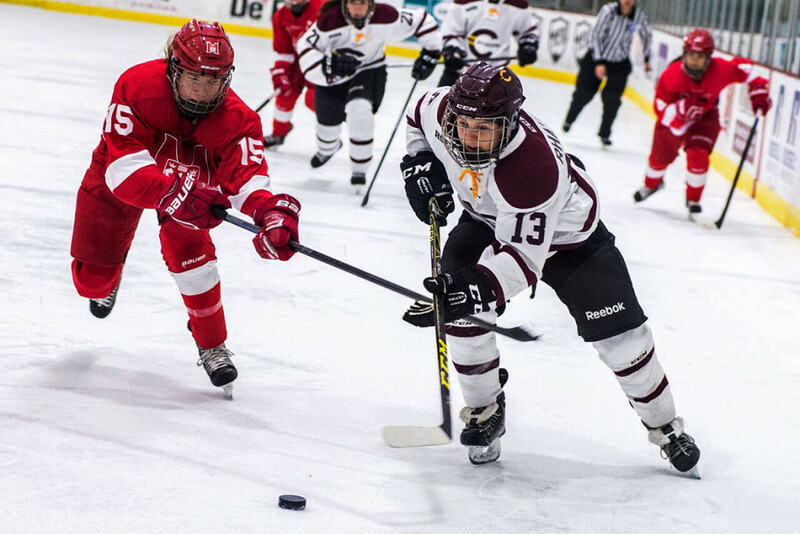 Concordia would add one more goal in the game, early in the third period, before Gee-Gees’ Carol-Ann Upshall narrowed the score line for her team. With under three minutes left in regulation, Concordia defender Caroll-Ann Gagné was penalized for a tripping call, allowing the Gee-Gees to score on the power play and tying the game at four goals apiece. Following a goalless overtime period, the Gee-Gees would prevail over the Maroon and Gold in the shootout. Despite allowing two goals in the third period, which lead to the overtime, Chu was content with her team’s play. The Gee-Gees are now in second place in the standings, one point behind the conference leading Université de Montreal Carabins. Meanwhile, Concordia has a difficult task on their hands, as they will face the Carabins on Jan. 15 at the Ed Meagher Arena.